This is why so many stories have payed homage to the King of Hell (yeah, he wrote about Heaven and Purgatory too, but those are less interesting). If you watch the movie 1408 carefully, you’ll see and hear subtle references to these circles of Hell, especially when he ends up frozen near the end, since Dante told us that, despite our belief that Hell is on fire, the innermost core is actually frozen solid. Another who tackled the themes presented in Dante is the editor of Indiana Horror and Indiana Science Fiction, James Ward Kirk, in his story, “Ghosts in the Mirror” (Dark Gothic Resurrected Magazine), which follows protagonist Dan Teagarden (Dan Tea-garden. Dan Tea. Dante. Get it?). Dan’s family has been butchered, his wife’s eyeless body left in his house and his children missing but for the blood and clothing. Determined to find the culprit, Dan constructs a list of people he thinks might have done it, all exhibiting some sin like pride or avarice. Then he and his friend Virgil venture into their homes, only to discover that their families have been killed too. Dan is horrified, but Virgil tells him that sinners do not deserve their tears. 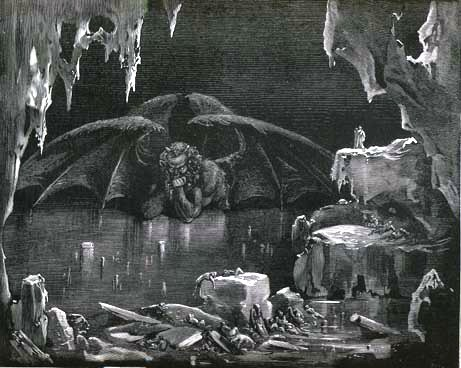 The exploration into the sinners’ homes mimicks Dante’s descent into Hell, complete with guide Virgil to show him the way. I’m sure the missing children means something as well, but I’m drawing a blank; any Dante scholars have an answer? Anyway, it’s a short but interesting story, written in a style that reminds me of Medieval writings while still remaining in the present time, so if you’re interested in stories that utilize the Dante mythology, you can put it on your list. The Inferno is a fascinating and detailed look at Hell, and its ideas have long been snatched up to use as themes or allusions in other works of fiction. Any other stories or movies you know use Dante’s ideas? Post them below! I haven’t read “Ghosts in the Mirror” but it seems that maybe the children are like the beautiful, innocent and angelic Beatrice who — in the story — proceeded Dante into heaven (in the cantos, she takes over from Virgil and guides Dante through Purgatory and Heaven). Does that seem to fit? Motivation for the protagonist to go through Hell. Hmm, that’s an interesting idea! I like it–I was also thinking it had to have something to do with their innoence. Maybe it is this innocence that stopped them from appearing in this “hell”? Greg, this is more than just “a thought.” Good work. You know, Joanna, I was very excited to read The Inferno when I finally got my hands upon it; however, when I did, I struggled getting through it. This post makes me think to try again. Perhaps I will. Thanks. The Great Divorce has some Dante-esque stuff.